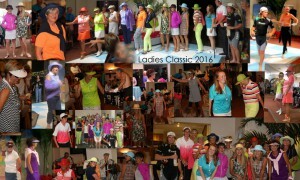 The 2016 Ladies Classic is done & dusted and by all accounts it was another most happy and enjoyable event. A rainy Sunday washed out the first day’s play, reducing the tournament from 54 to 36 holes. We welcomed all the Ladies on Saturday afternoon in the rain and it then kept on raining for the next thirty hours. The Saturday evening welcome cocktail party with its Hawaiian/ beach party theme set the tone for the tournament and the fashion show and our local ace band “The Legends” made for a fun filled Saturday night. 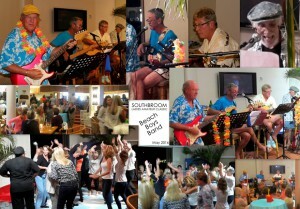 Thanks to Legends Players – Richard Bridgeford, Des Erasmus, Mel Davies and Josh Pretorius for sharing your talents starting the party so well! 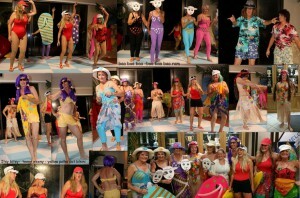 The fashion show was as colourful & stylish as always and even included the guys wearing wetsuits. (we didn’t realise how appropriate that would turn out to be!) Thanks to all our volunteer SuperModels! One of the features of the Ladies Classic is how beautifully the ladies dress throughout the tournament and this year was no exception. It may have rained, but that didn’t stop our ladies from having a good time! Waking up to pouring rain on Sunday morning (which flooded the golf course making it unplayable) put a bit of a damper on the golf but not on the ladies spirits. Breakfast at the club was enjoyed by all and I did a golf clinic in the torrential rain with all the ladies on the veranda. It simply rained too hard all day for there to be any golf and course was unplayable with the 120mls needing to drain away. But the ladies made the most of the day and night and gradually the skies lightened. Starting with dinner and then a show skit, put on by our group of lady members led by Lady Captain Rene Matthew and trained by a very patient and super dance instructor, Deanne Purtell. Dane & Dj were also in the show, together with Jean Cole, Janet Humphrey, Allyson Thomas, Candida Amm, Jeanette Peyios, Michelle Davies, and of course Rene. The theme was the Beach boys. And the evening turned into a beach party of note! Our special performer Winston Smile was an amazing singer / showman and wowed everyone with his whole repertoire, including singing Opera that gave one goose bumps! Thanks to the Local volunteers! Thanks to so many special members who all put in a whole lot of effort and helped with the costumes, props and décor for the evening. Special Thanks to Irene Schanda, who sadly had to leave for Austria with the sudden sad passing of her mother. Irene & Shelly Myers had worked hard with the models and actors outfits and Erwin Schanda once again did fabulous decor work. Local entertainer Winston Smile wowed the ladies & had the entire room dancing till late. Gavin’s staff of Adri, Thembi, Pete and all the bar staff put on a great show of delicious food and great service altogether creating a superb evening. The golf course played quite tough and good scoring was never going to be easy. 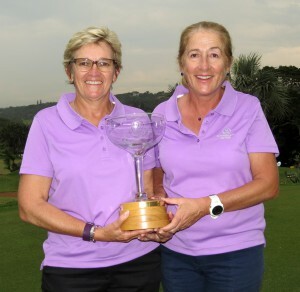 The best score on day one was 44 points by Margi Bonini and Olive Heimstra with the teams of Tessa Hinton & Jo Morley – Jepson, and Karen Bridgeford & Shirley Jeffery trailing by one on 43 points each. There were a number of teams in with a chance with only one round to go. Tuesday was a gorgeous morning with a shotgun start at 8am and the ladies were quickly into the swing of things. 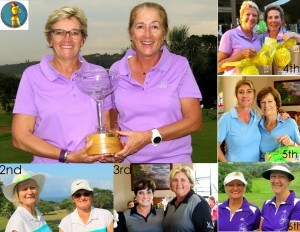 Scoring was good on a much drier golf course and the ladies looked special in their beautiful attire. The field was blown away by Tessa Hinton and Jo Morley-Jepson who made 48 points for a total of 91. To be crowned our new Classic Champions! In second place were Jenny Ralph and Liz Davies beating Jo Ledden and Anna-Mart Steyn on a count out. It was so nice to finish the Classic on a good note with some fine sunny weather. Well Done again to the hard working Ladies Committee and special thanks Deanne Purtell , Karen de Rosa and Chanel of The 3 Black Dresses for all the wonderful décor, enthusiasm and transforming the club house magically. Thanks to dapper, silky voiced announcer Kerry Fielden & our handsome starters Mel Davies & Bob Thomas. 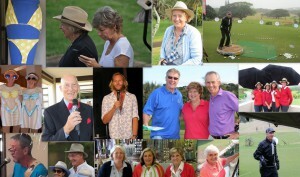 Also our roving paparazzi photographers, Rose Bishop, Dawne Murray & Richard Bridgeford who captured the essence of the tournament with their artistic eyes and fabulous lenses. Course Marshals / Rules Ladies – Augi D Ewes & Di Morris. and efficient Registration Ladies Angela, Heather & Nicola.